Crate training is an important part of raising your dog. The crate, or kennel, is an important dog training tool as well as a safe means of confinement. Crate training also very useful when house training your dog. Even if you don't plan to crate your dog often, it's still important that your dog is crate trained. This will help if there are times throughout the dog's life when it needs to be confined to a cage or crate, such as at the veterinarian or while boarding. Although crate training is valuable, it doesn't work if you can't easily get your dog to go into the crate. It can be pretty frustrating to get your dog to enter the crate when you ask, especially because it's usually at a time when you are ready to leave the house. The good news is that you can train your dog to get into the crate on command. To train your dog to get into the crate on cue, you'll need some treats and a crate. If you are clicker training, you'll also need your clicker. Choose a command to let your dog know it is time to get in the crate. Many trainers use the words "kennel" or "kennel up." You can use any word you wish. Just make sure it doesn't sound too much like the dog's name or another cue word you use and remain consistent with whatever cue word you choose. How to Teach Your Dog to "Kennel Up"
You can usually teach your dog the "kennel up" command in a few short training sessions. Start by standing in front of your dog's crate and showing some valuable treats. Make sure your dog sees the treats and wants them. Say the cue word and throw the treats into the back of the crate. As soon as your dog walks into the crate to get the treats, praise the dog and click your clicker (if using one). If you're working on the wait command, make your dog wait before you release it from the crate. Then release the dog from the crate right away. Repeat this process several times, ending with a positive experience and praise. Practice the "kennel up" command a few times a day for about 10 minutes each session. Don't push your dog for longer than 10 minutes per session. After several days, you can stop throwing the treats into the crate but continue saying "kennel up". The first few times, you might have to move your hand as if you're throwing a treat inside after you give the command. When your dog gets inside, click your clicker or praise the dog and drop a treat into the crate. With a few practice sessions, you should be able to get your dog to step into the crate immediately as soon as it hears the cue word. By then, the treats for every command should be unnecessary. The crate should be a place of comfort for your dog. If your dog seems anxious inside the crate, don't leave the dog alone until they get used to it. Try feeding your dog in the crate and letting it spend time in the crate while you are around. Let the dog out after a short period of time (ideally while calm). Gradually increase the length of time you leave the pup in the crate. Once your dog seems to consider the crate its own space and can relax in there, then you can start leaving the dog in there when you leave. The last thing you want is for your dog to associate you leaving with anything fearful. This can lead to or exacerbate separation anxiety. If your dog is not running into the crate for the treats, you may need to find something more valuable to entice the pooch. Try to find something they cannot resist, like stinky treats, hot dog pieces, chicken, a new squeaky toy, etc. 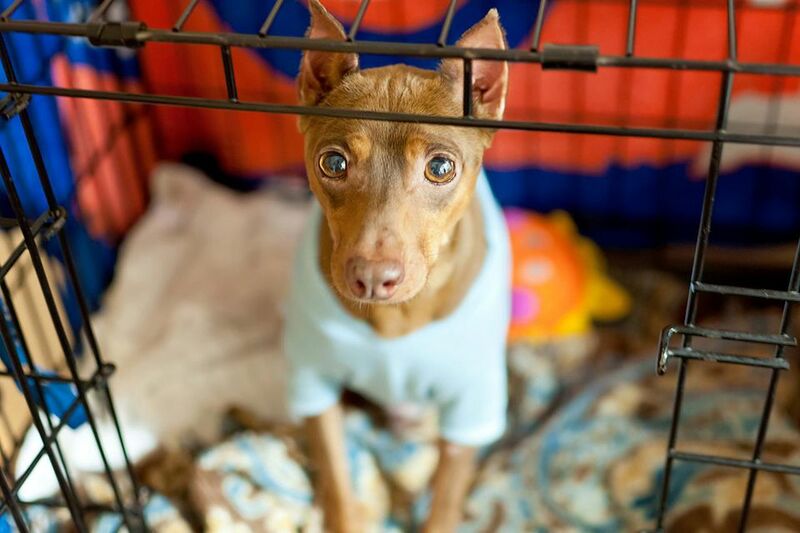 Don't force your dog into the crate, especially if your dog seems afraid of it. Instead, make the crate extra comfortable (a nice plush bed will work). Leave the crate open at all times, put your dog's favorite toys inside, and feed your dog as close to the crate as it will get. If there is a removable top, take it off. As your dog gets more used to the presence of the crate, increase the proximity of the feedings. It may take some time, but your dog should get over the fears. If you continue to have trouble getting your dog to get in the crate on cue, seek help from a dog trainer or behaviorist. Ask your vet for recommendations or a referral.